This is a repost of an August 2018 post. As with many progressive-run cities on the west coast, Seattle has a major homelessness population. So how did the bureaucrats in Seattle decide to spend waste taxpayer dollars to solve the crisis and build affordable housing at a more rapid pace? By spending $14 MILLION taxpayer dollars on a new construction/permit system. The system has been described as a failure, nightmare and debacle. Just about what you would expect from a government agency. 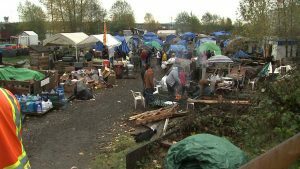 Here’s the report on Seattle’s latest attempt to keep the homeless industrial complex alive and well. From the Seattle Times: Debacle. Screw-up. Nightmare. Those are some of the words builders use to describe Seattle’s new $14 million online system for construction permits, inspections and complaints. The botched rollout of a flawed system has cost time and money, they say, angered clients and delayed projects the city needs to house its exploding population. Soon after launch, the new system repeatedly stalled and permit documents appeared to go missing. Tempers grew so hot that at one point the city called the police on a livid customer. The Seattle Department of Construction and Inspections (SDCI) began planning for the new system years ago but chose to transition at an awkward moment — the start of the warm-weather construction season at the peak of a historic building boom. The department already was dealing with severe backlogs, and the chaotic April 30 transition made them worse, affecting projects ranging from kitchen remodels and backyard cottages to stores and apartment buildings. The number of permit applications completing initial review plummeted 75 percent from April to May, from 266 to 66, meaning some 200 projects were initially set back. I’m fresh out of empathy for progressives. You continually elect ineffective leaders who do nothing more than waste your hard-earned money. If voters in Seattle, San Francisco, Los Angeles, Portland, etc. truly cared about the homeless, they’d start electing officials – other than democrats – who can actually address their citizen’s needs. This entry was posted in Insanity, Liberals/Democrats/Left, Taxes, United States and tagged affordable housing, construction, homeless industrial complex, permit system, Seattle, Seattle Department of Construction and Inspections, Seattle's homeless crisis, Washington State. Bookmark the permalink.